It is beautiful and so soft!!! 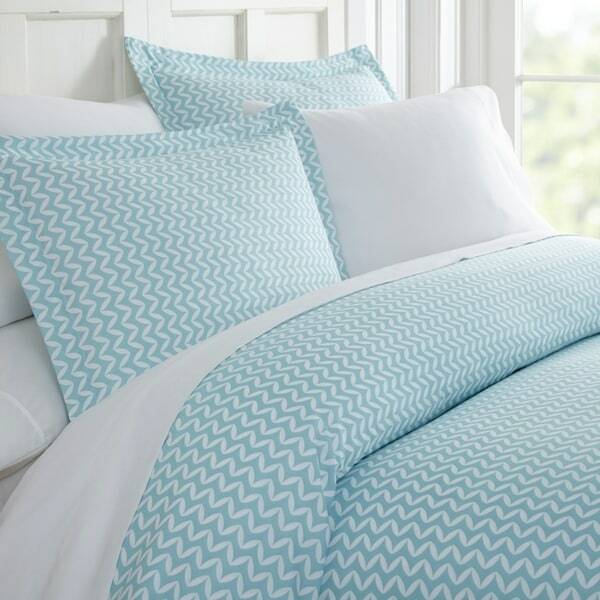 Included in the Puffed Chevron 3-Piece Duvet Cover Set by Merit Linens you receive 1 ultra soft, wrinkle free Duvet cover and 2 matching Shams. We offer a wide range of color choices to provide the best match to compliment your bedroom. In addition, it's 100% hypoallergenic, antimicrobial, and antibacterial. I like the color pattern of the Duvet. The product exceeded my expectations because it did not cost that much and I am very happy with the Duvet. The product information was accurate. No surprises. I would recommend this product to a friend. I wanted something light and soft for the summer. This is perfect and soft. This set is truly oversized and it can accommodate a California size cover. Launders beautifully. Excellent value. I love the feel and look of this material!! Not sure if it’s my down comforter or this duvet cover but there is extra material on the sides of the cover where the comforter doesn’t reach?! Nice product for the value! I ordered this 3pc duvet set ,because my daughter had one I had bought her a few years ago .BY THE WAY THE LAST ONE COST ME 4 TIMES WHAT THIS ONE DID. My daughter just loves it because of the zipper instead of buttons on other one also the color stands out and picks the whole bedroom up .Now she can change her duvet set whenever her 2 dogs soil it . She is very happy with it and the price was great. I am ordering another one for me. My twin duvet sets were a very ugly shade of light lime green. I cannot use them with my decorstive pillows, unfortunately. This is a very nice duvet. Has a zipper closure, which is great. It is a nice large size, and the material is soft. Really a nice looking duvet. Nice price for a nice set. NOT thick and high quality. It actually fits an over-sized queen comforter and THAT is very difficult to find. Nice wrinkle free lightweight sheets - have held up nicely through many rounds in the washer and dryer. QUALITY WAS GOOD - HOWEVER THE COLOR WAS AQUA AND NOT LIGHT BLUE AS I HOPED. This is microfiber and therefore doesn't really have a thread count. If it were to be counted in thread count, then the microfibers would be close to 2000.